Philip O'Sullivan is a financial analyst, Business & Finance magazine's Markets Correspondent and an MBA student at the Smurfit Business School in UCD. At a headline level, the national picture of Ireland's rental market is one of continued stability, with rents rising by 0.1% in Q3 2011 relative to the previous quarter. This marks the fourth consecutive quarter without a decline, which is a remarkable outturn given the difficult economic backdrop. 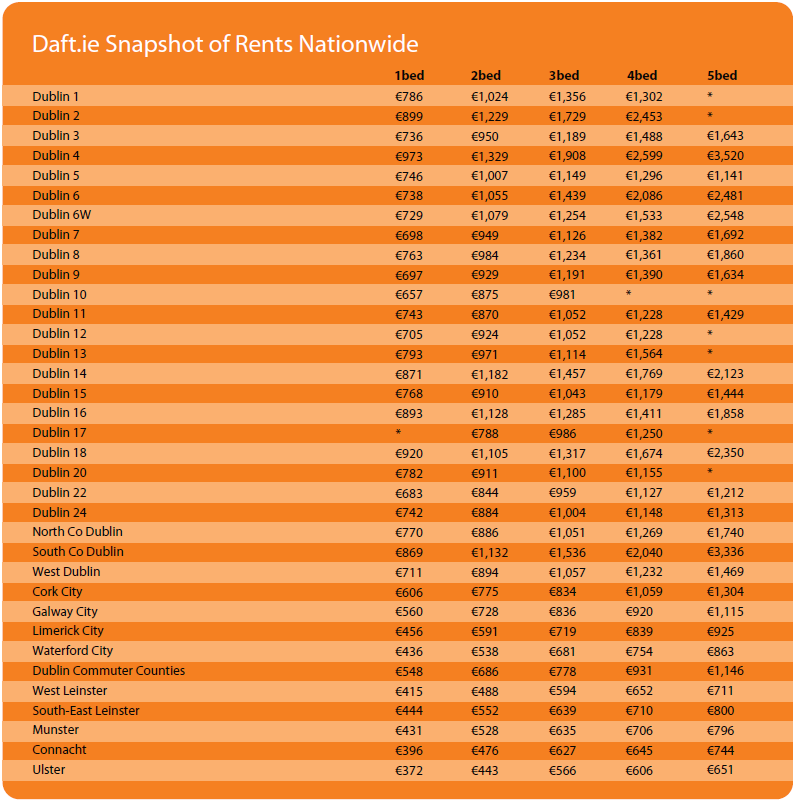 Another encouraging point from the latest Daft.ie figures is the data on the stock of properties available for rent. At the beginning of November this stood at 15,948 a 9.3% decline on year-earlier levels and the second lowest level of rental properties advertised on Daft.ie since the third quarter of 2008. While the national picture is reasonably encouraging, there are significant regional variances, with urban areas outperforming rural ones. While rents eased back slightly (-0.3%) during the quarter in both Dublin and Cork, they are still in positive year-on-year territory, rising by 0.8% and 6.2% respectively. In terms of the other cities, Galway (+0.4%), Limerick (+0.3%) and Waterford (+1.2%) all recorded quarterly increases in rents. The picture for rural Ireland is somewhat different, with rents in all four provinces declining by between 1.7% and 3.1% compared to the same period last year. More ominously for these areas, the decline in the stock of available properties for rent has been largely concentrated in the main cities. On November 1, there were 11,100 properties available to rent outside of the main cities, down only 5% from a year previously. This compares with a fall of about 18% in the stock of properties available to rent in Ireland's major urban areas over the same period. 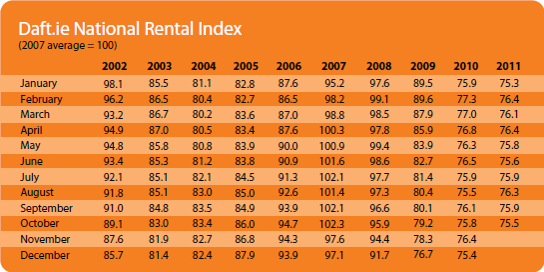 What does this all mean in terms of the outlook for the rental market? In short, it appears to be "A Tale of Two Irelands". The housing dynamics for urban areas look decidedly rosier than for their rural counterparts. 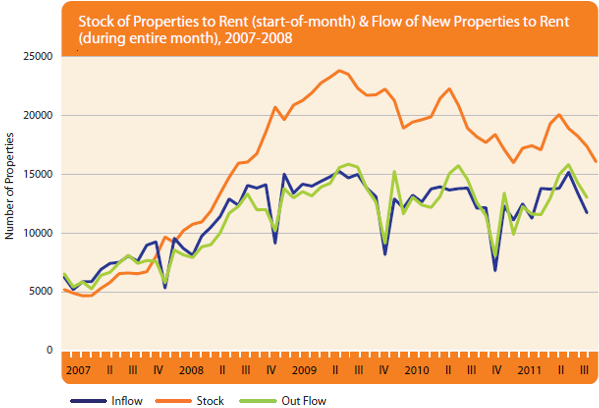 Supply, as measured by stock, is tightening in the main cities, with available rental properties in Dublin having fallen by 57% since the peak in 2009. In contrast, despite rents in rural areas having fallen by between 20% (Connacht) and 29% (the Dublin commuter belt) from the peak, there remains a large overhang of available properties which will likely put downward pressure on rents for many quarters to come. The "Two Irelands" narrative is further supported by the data on rental yields. The average rental yield in Dublin city centre is a chunky 7.2%. That is the type of figure that will surely flush out some investor interest, but of course translating this interest into buying action will not be straightforward given the availability and cost of credit. While the national average (which includes Dublin) rental yield of 4.8% has increased by 70 basis points in the past year, yields in many areas remain too low to attract investors, as illustrated by the "Rent-a-room income and net loan burden" table on page 10. Moving beyond the data compiled by Daft.ie, while the overall rental market has proven resilient in spite of challenging economic conditions over the past year, there are no signs of a let-up in these pressures in the near term. The government's recently published Medium-Term Fiscal Statement illustrates this in two ways. Firstly, the Department of Finance (DoF) cut its GDP growth forecast for 2012 from the previous 2.5% to 1.6%. As with the Daft.ie figures, the devil is in the detail, with a positive GDP headline rate masking the fact that this growth will be driven by multinational-dominated net exports, with domestic demand (the sum of private consumption, government consumption and investment) set to contract by 1% next year. So, the domestic economy is unlikely to provide much by way of support to the property market in the near term. The second challenge, as illustrated by the government's budgetary plans, is that between now and 2015 Minister Noonan intends to introduce €4.65bn in what are euphemistically termed "revenue raising measures", while cutting €7.75bn in public spending. This fiscal consolidation, which totals just under 10% of Ireland's GNP, will place a further burden on the wider property market over the coming years as disposable incomes come under more pressure. Of course, as a small open economy we cannot ignore the gloomy outlook for our key trading partners. The US, UK and Euro-zone are, like ourselves, all struggling with low growth, unsustainable fiscal deficits and a lack of obvious near-term catalysts for a meaningful recovery. Granted, their troubles are a key factor behind recent downward revisions to growth estimates, such as the DoF's, for the Irish economy, but with the risks to growth in our major export markets seemingly skewed to the downside, any further deterioration would have clear implications for Ireland's economic prospects. And as the economy goes, so goes the housing market. Tying it all together, while rents, in aggregate, have been levelling off, there is some divergence at a regional level. A difficult growth outlook, with continued high levels of emigration and unemployment, allied to a large surplus of rental properties, bodes ill for rents in rural areas. In contrast, in the cities, tightening supply – only a third of available rental properties in Ireland listed on Daft.ie on November 1 were located in Dublin, Cork, Limerick, Waterford and Galway – and elevated yields suggests that there is rather less 'downside risk' to rents in those areas. Overall, the divergence between the rental markets in urban and rural Ireland is a theme that looks set to continue over the coming year.